Golden knots hammered out on jewellery, golden knots painted around pages… a golden knot of letters forming the word ‘Book’, a golden grid of letters with an inbuilt riddle… This exhibition at the British Library held me spellbound, almost as if the pagan spells and chanted prayers, curiously mingled in those early days of Europe, had arisen out of the parchment or bronze. There are even mesmerising recordings, in both Latin and in Old English, also known as… Anglo-Saxon. Anglo-Saxon Kingdoms: Art, Word, War runs until 19 February 2019 and is enormous; I strongly recommend walking through all rooms to decide where you start and what to look at in more detail. The show includes books, manuscripts, and a map with the British Isles squashed into a bottom corner of the known world, as well as swords, horns, bowls, brooches, and a huge cross with a Christian inscription in runes! If you, too, were impressed by the exhibition at the British Library, you may wonder how you can pass your knowledge of Britain’s roots and your enthusiasm for the sheer beauty emerging from the ‘Dark Ages’ on to your pupils or children. The British Library has created an overview on a dedicated webpage featuring images of manuscripts in highest quality. It also organises workshops with schoolchildren as well as training sessions for teachers and PGCE students. The nearby British Museum displays its Anglo-Saxon treasures in the gallery spanning the long misty and indeed rather dark time between the end of the Roman Empire and the height of the Middle Ages (Room 41), right next to the gallery on Roman Britain (Room 49). The permanent galleries of the British Museum are free of charge, of course, and that is where you find the treasures of Sutton Hoo and Staffordshire — literally, sparkling hoards dug out of the earth. The British Museum, too, offers plenty of online guides for teachers who plan a visit to the Anglo-Saxon galleries with their pupils, including slides to download. The Newsam Library at the UCL Institute of Education can supply you with many materials for your quest and that of children in your care. Our Curriculum Resources Collection include much more than textbooks: a large collection of non-fiction and fiction for young people. For adults, too: I promise you you will not be able to stop reading! A number of our books about Anglo-Saxon times are described on the Beowulf page of our LibGuides. You can find more on the UCL Explore catalogue by searching for Anglo-Saxon* and filtering the results to ‘Curriculum Resources’ on the left-hand menu. You may want to grab Margret Sharman’s Anglo-Saxons for an overview in twelve double pages. The language is so easy that a child can follow as soon as he or she can read, and an adult can hoover the knowledge up in a glance. You can look at everyday life in Anglo-Saxon times, at buildings and settlements, at religion, literature, arts and crafts – we have books or chapters on all these fields. Perhaps you could tie the ancient nations in with your area of the curriculum or with your children’s interests. Some books show how treasures were found and investigated or how history is explored in other ways. Some consist of humorous facts and anecdotes, while Beowulf has inspired novels and graphic novels, plays and films, some of which we hold. If you wonder where all the other nations of the past come in, we have books about that, too: Celts, Romans, Vikings, Normans, not to forget the Scots. Two very appealing examples are Anglo-Saxons and Vikings from the Usborne history of Britain, and The Saxons and Vikings from Hamlyn’s History of Britain, both full of beautiful photographs and artistic impressions. If you need some background reading yourself, we can offer you the massive volume by James Campbell and one of those Very short introductions of Oxford University Press, by John Blair. For background knowledge of the arts, see Anglo-Saxon literature by Hugh Magennis, Anglo-Saxon art by Leslie Webster, and Anglo-Saxon crafts by Kevin Leahy. Of course, UCL has more books on Anglo-Saxons in other libraries, for example at the Institute of Archaeology, and plenty of online resources, with full text available on site for visitors, and anywhere in the world for current staff and students. I hope to see you wandering around with open mouths and eyes at the British Library and the British Museum… or crouching between the shelves at the Newsam Library! 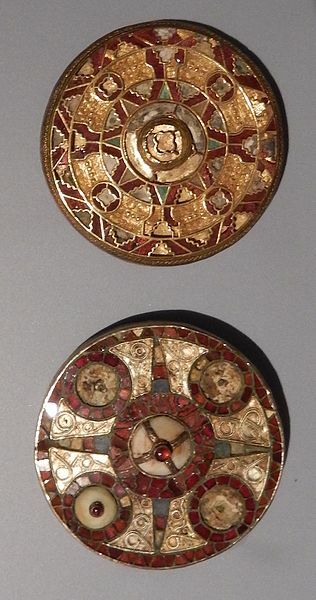 Illustrations: Anglo-Saxon disc brooches, Ashmolean Museum, Oxford. Author: BabelStone [CC BY-SA 3.0]. 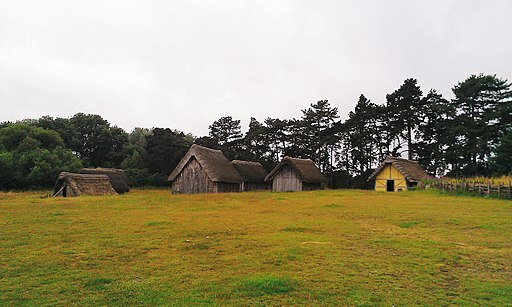 — West Stow Anglo-Saxon village. Author: Midnightblueowl [CC BY 3.0]. 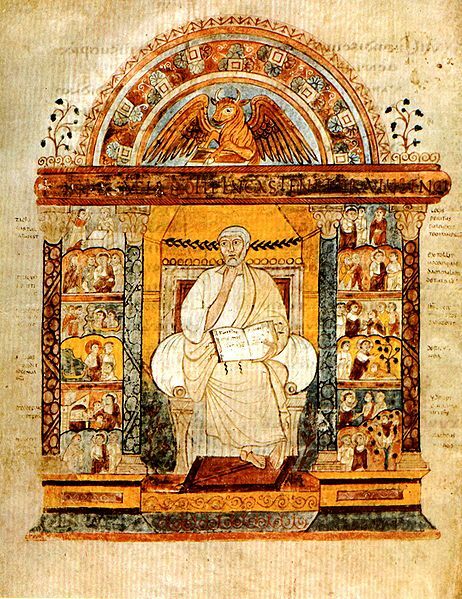 — Augustine’s Gospel, 6th century AD, as seen at the British Library. Unknown author [Public domain], via Wikimedia Commons. This entry was posted in Curriculum Resources and tagged activities, Anglo-Saxons, British Library, British Museum, Dark Ages, history education, manuscripts, Middle Ages, museums and education. Bookmark the permalink.